A state authority has approved a master plan for an $830 million transformation of Camden’s Waterfront and offered $15.6 million in tax incentives to a Mount Laurel firm weighing a move to Camden. The Economic Development Authority (EDA) also approved a change in location and ownership for a planned Camden hotel and both these actions affect potential projects on the city’s redeveloping Waterfront. 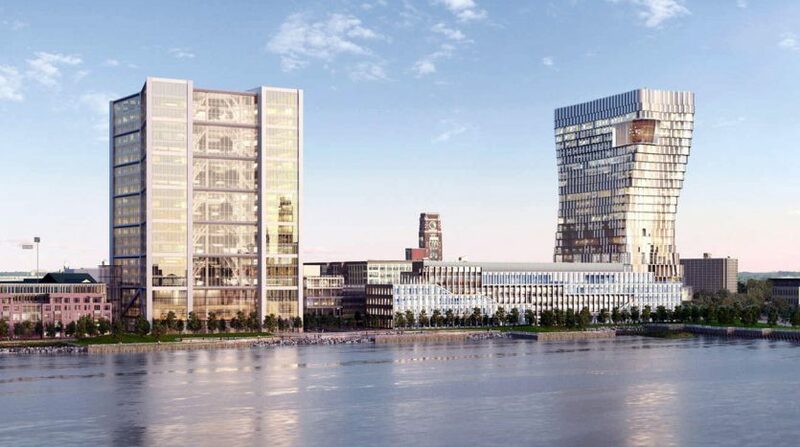 A Mount Laurel firm has been offered $15.6 million in tax incentives to move its headquarters to the Ferry Terminal Office Building on Camden’s Waterfront. The Mount Laurel firm, Corporate Synergies Group LLC, would use the incentives to defray the cost of moving its headquarters to the Ferry Terminal Building on Aquarium Drive, the EDA said. It said the firm, which offers insurance products and related services, would bring 117 jobs to Camden and is expected to create 25 new positions. The company is also considering a site in Bensalem, Pennsylvania, the EDA noted. It offered the 10-year tax break under a program intended to keep jobs from leaving the state. The move would have a net benefit to the state’s economy of about $6.8 million over 35 years, according to the EDA. The 35-year measuring stick is allowed under a 2013 state law intended to steer business expansion to Camden. So far, the EDA has approved more than $1.5 billion in tax breaks for Camden projects under that law. Corporate Synergies would occupy about 27,000 square feet on the second floor of the Waterfront office building, which is owned by a partnership including Democratic power broker George Norcross III. EDA also approved a related partnership that had been funding a planned eight-story hotel near the Waterfront. 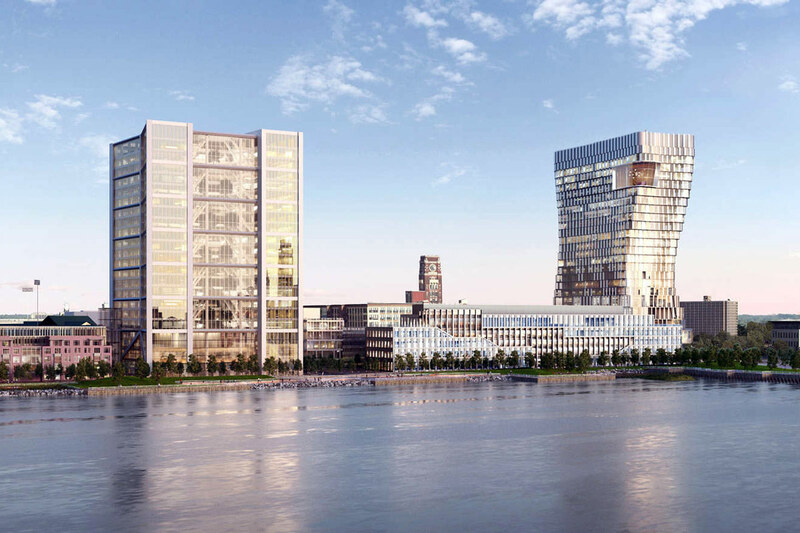 The hotel, initially set to rise at Cooper Street and Riverside Drive, would move to a 19,000-square-foot site on the nearby Waterfront. The hotel now is expected to occupy a 19,000-square-foot site on the northeast corner of Water and Penn streets, according to Liberty Property Trust, a Malvern, PA, firm developing the overall Waterfront site. The new site will allow more hotel guests to have a view of downtown Philadelphia, according to the EDA. It said the view from the original location would have been blocked by an 18-story office building being erected by a Norcross partnership. Liberty Property hopes to develop an office building at the hotel’s original site and the development firm is expected to sell the riverside site to the new investors for $4 million, according to the EDA. The authority, which in June, approved an $18.3 million tax break for the proposed 180-room Hilton Garden hotel, offered no reason for the change in investors. It said the hotel project would continue to be led by hotel developers Kam Babaoff and Frank Cicalese, who are participants in six entities that make up the new investment group. The largest of the new investors was identified as the Zarabi Family Trust, which is controlled by Frank Zarabi. Additional details about Zarabi and the other new investors were not immediately available. Construction of the hotel is to start in September 2018 for completion by March 2020, the EDA said. Read the full article at the Courier Post.